Khenpo Appey Yönten Zangpo (Tib. མཁན་པོ་ཨ་པད་ཡོན་ཏན་བཟང་པོ་, Wyl. mkhan po a pad yon tan bzang po) (1927-2010), one of the foremost masters of the Sakya school in recent times, was a student of Jamyang Khyentse Chökyi Lodrö and the tutor of Sogyal Rinpoche and Dzongsar Khyentse Rinpoche. 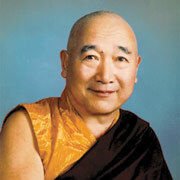 Khenpo Appey was born in Kusé in the kingdom of Dergé in 1927. He studied at Serjong Monastery and later at the Kham-jé shedra at Dzongsar Monastery. At the age of nine he became a monk at Serjong Monastery, where a year later he received his first teachings from Gapa Khenpo Jamgyal, also known as Khenpo Jamyang Gyaltsen. For nine years, from the age of 14 to 23, at Serjong Shedra, Khenpo Appey studied ‘the thirteen classical texts’ based on Khenpo Shenga’s famous annotation commentaries. During his last two years at the shedra he studied with Khenpo Dragyab Lodrö who later became the fifth khenpo at Dzongsar Shedra and wrote a commentary on the ninth chapter of the Bodhicharyavatara. After his nine years of intensive study at Serjong Shedra, Khenpo Appey went to the shedra at Dzongsar Monastery, where he was able to continue his studies under Khenpo Dragyab Lodrö for another year. He also studied with Dezhung Ajam Rinpoche. He went to see Jamyang Khyentse Chökyi Lodrö in Sikkim in 1957. He then returned to Tibet and spent time at Ngor Monastery, but left in 1959 when Tibet was lost. He went to see Jamyang Khyentse who was ill in Sikkim. After Jamyang Khyentse passed away, in accordance with his final wishes, he began to teach Sogyal Rinpoche, giving him instruction on the Bodhicharyavatara in the Palace Monastery in the presence of Jamyang Khyentse's kudung. Later, while Sogyal Rinpoche was attending school in Kalimpong, Khenpo Appey spent one or two years in retreat in a small village in Sikkim. He was later requested to tutor Dzongsar Khyentse Rinpoche. For this purpose, he founded the Sakya College in Barlow Ganj, Mussoorie, on 19th December 1972, the anniversary of Sakya Pandita. In the first year, there were only seven students. Dzongsar Khyentse Rinpoche studied there for five years. From 1972 to 1985, Khenpo Appey worked full time to look after the college and was responsible for teachings the classes, supervising the administration and raising funds. In 2001 he established the International Buddhist Academy in Boudhanath, Nepal. He passed away in Nepal on Tuesday 28th December, 2010. This page was last edited on 26 July 2011, at 13:08.